Develop an engagement programme that establishes Canal & River Trust as a respected guardian of the waterways and inspire more people to use and enjoy them and sign up to become a friend/supporter. The programme must stand out from the usual way most organisations communicate with supporters. 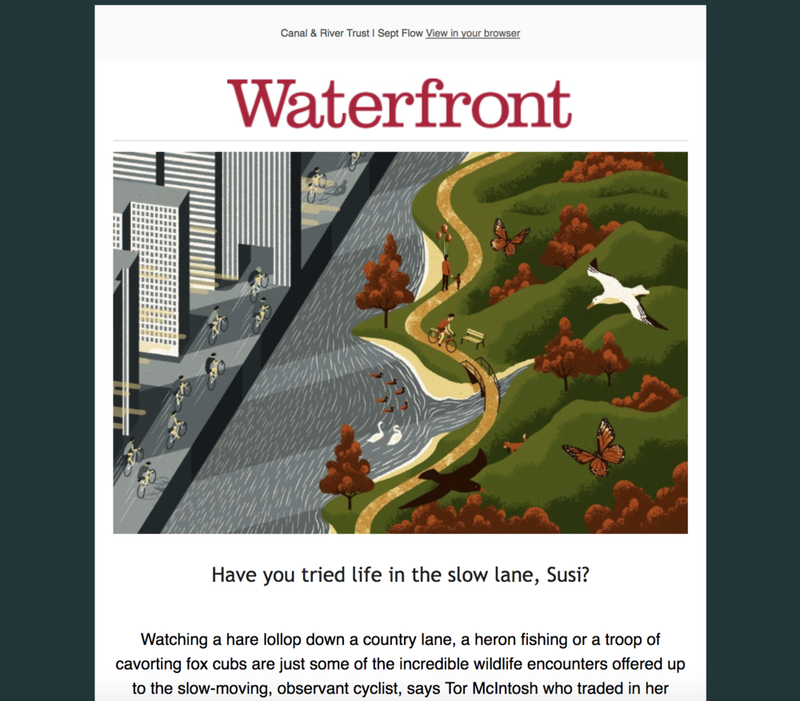 A bi-annual magazine and fortnightly multimedia (film and audio) email newsletters for supporters filled with waterside stories, connecting them not just to the charity but also the waterways. "I have just received my copy of Waterfront and wanted to say what a beautifully produced magazine it is. Edward Tuckwell’s swan illustrations are a triumph as is the publication overall. I’ve been in the advertising industry for far longer than I care to remember and have produced many in-house magazines and brochures of all types, so I know good design when I see it. Well done to the editor and everyone involved"
"I've just received my first edition of Waterfront and would like to congratulate you on it. It's a beautiful magazine, with a range of interesting features, no advertising and doesn't come out too often. I'm really pleased to have received it. It is much better than others I receive, such as the National Trust's magazine. Keep up the good work"